Some followers have told me they are not receiving automatic notification when I post a new blog. Hardly surprising if you are following a blogospheric idiot who doesn’t know the difference between a geek and a slashdotter, however much he may know about watercolours. I’m sorry if you have had no joy with this, but I believe the problem is now sorted: on the top right of the blog page you will see a ‘Follow by Email’ slot. If you enter your email address there and click ‘submit’ that should hopefully ensure you are kept informed. I’d like to take this opportunity to thank all of you who have become followers, left comments and sent emails about the blog, and I encourage you to leave comments as it helps me to find out what you like, or don’t like. As I live a rather varied life, from the rip-roaring exciting bits to the boring ones, there will be a wide range of subjects and approach. Some may be completely mad, while others will cover serious topics, and of course a considerable amount of painting ideas, tips and information. It will be covering areas that often do not appear in my books and films. 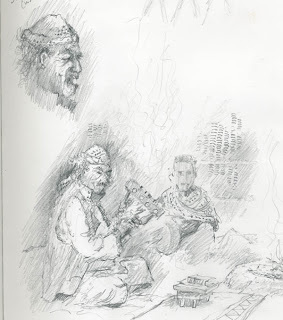 This time I’ve included a sketch done many years ago of the Bedouin singer Abd Disardeq. I love figure work of all sorts and this was a delightful evening in Bahariah Oasis in the Western Desert of Egypt. 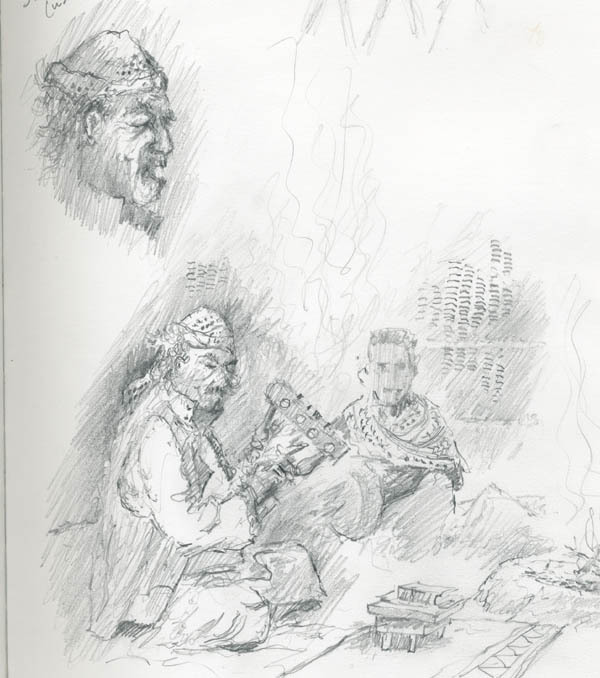 In the sketch it may look as though Abd is playing music on an old chair-leg, but in fact it is a Bedouin musical instrument called a simsemeia. He is accompanied here by one of his sons. I painted a full watercolour from this, and kept it as it so reminds me of a wonderful evening in the company of many extremely kind and hospitable local people. So the lesson is: don’t go anywhere without your sketchbook!